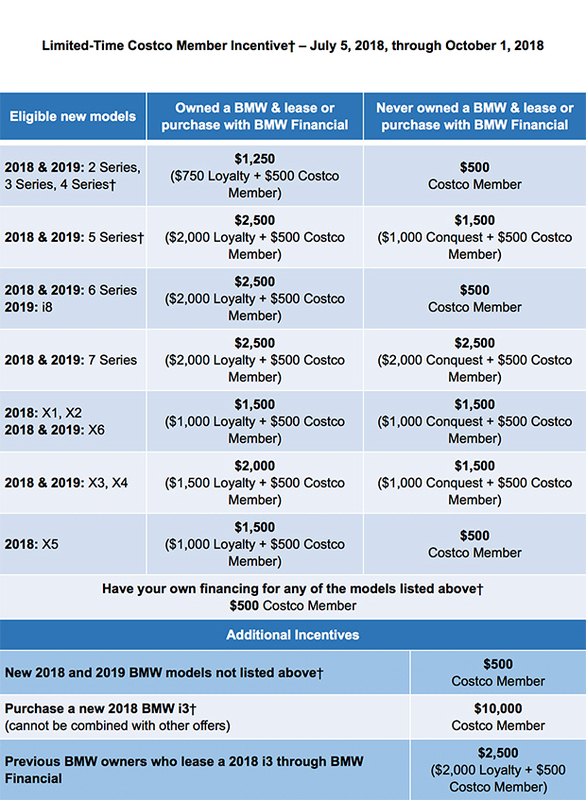 Costco Auto Program and BMW have partnered to provide a limited‑time offer to Costco Members and their family members residing within the same household. This offer is a great way for you to get into The Ultimate Driving Machine®. Please review the offer details below, along with important dates and additional information to help you take advantage of this limited‑time offer. †Excludes 2018/2019 M2 Coupe/Competition, 2019 M3 CS Sedan, 2019 M4 CS Coupe, and 2019 M5 Competition. See requirements and exclusions detail below. 1. Be a member by July 5, 2018. 2. Register with Costco Auto Program, either online or through our call center. 3. Receive a certificate with unique offer code upon registration. 4. Present the certificate to your dealership along with their Costco Membership Card at the time of purchase or lease. To qualify for this offer, the customer must: (1) Be a Costco Member by July 5, 2018; (2) Register with Costco Auto Program to receive a BMW certificate with the unique Type G offer code NEPP4317 ($500 Costco Member incentive); (3) Present their certificate to the BMW dealership at time of purchase or lease; (4) Take delivery or place a factory order on an eligible model between July 5, 2018, and October 1, 2018. Excludes: (1) BMW Pre-Owned vehicles and previously reported vehicles with more than 4,999 miles; (2) Cannot be used in conjunction with the following programs: Group Partner and Family, European Delivery, Diplomatic and Embassy, Military Sales (USAA), Limousine and Hotel Shuttle and/or VIP Purchase; (3) Loyalty and Conquest Credits are only eligible on a purchase or lease financed through BMW Financial Services and excludes 2018 M2 Coupe/Competition, M3 CS Sedan, 2019 M4 CS Coupe and 2019 M5 Competition; (4) $500 purchase or lease incentive excludes 2018 M2 Coupe/Competition, M3 CS Sedan, 2019 M4 CS Coupe and 2019 M5 Competition; and (5) $10,000 purchase or finance incentives on the BMW i3 cannot be combined with other offers, but can be combined with available federal or state EV incentives they qualify to receive.